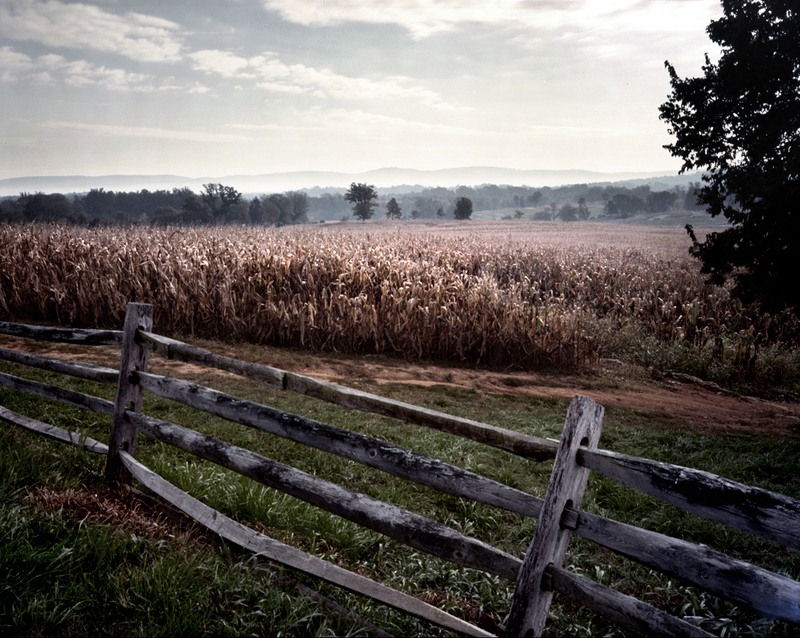 This blog reflects a battlefield-to-battlefield journey along the anniversary tracks of the American Civil War. It’s been an arduous and exhilarating trek across landscapes that remain, preserved by virtue of their terrible history, very much as they were 150 years ago—oases now from modernity, pristine and scarred as the great war left them, hallowed and haunting. The past is present on these battlefields. 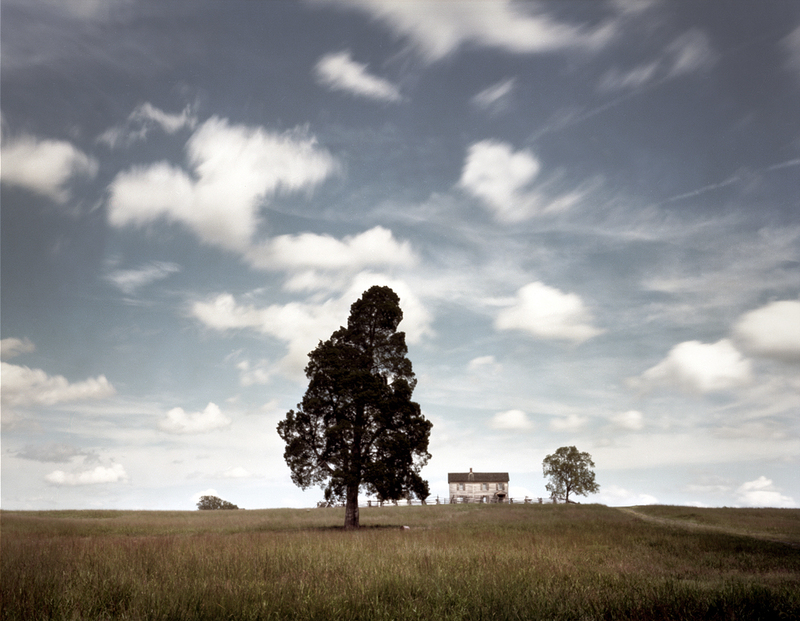 The images were created with large-format pinhole cameras— handmade wooden boxes with no lens, no viewfinder, and no shutter—that would have seemed primitive even at the time of the Civil War, but that, in uncanny ways, seems the perfect device for this project. The camera’s tiny, fixed aperture creates a soft, infinite focal plane—a canvas where details are obscured. The minuscule amount of light entering the camera requires a long exposure time that pushes the images into the ambiguous terrain between landscape and dreamscape. Wind blows, leaves rustle, clouds move, the earth turns. 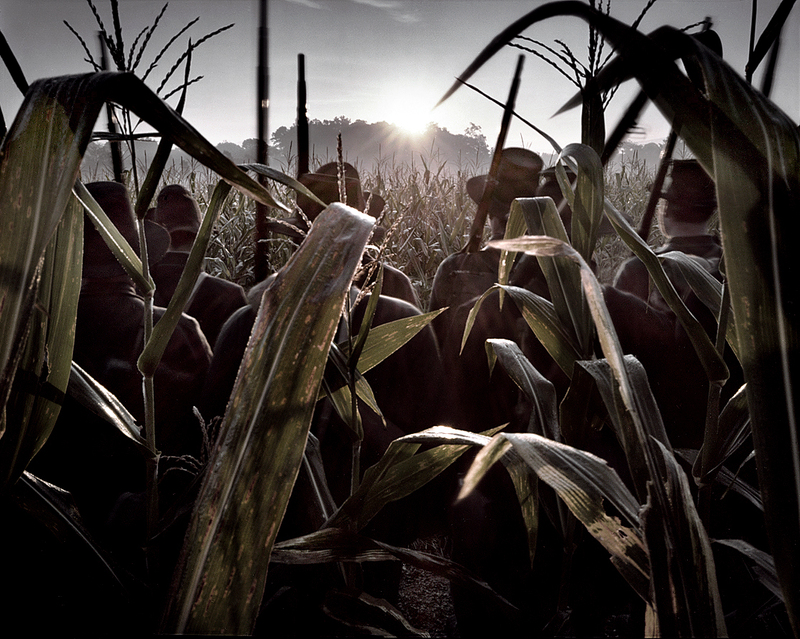 The pinhole camera lingers on these battlefields slowly drawing in the light. The images breathe with space and time. Soldiers’ journals and memoirs describe the battlefields as dreamlike, and that is how they appear through the patient eye of the pinhole camera. Time is stretched and ultimately upended, yielding ethereal panoramas where sharp precision dissolves into a deeper resonance of memory and imagining. 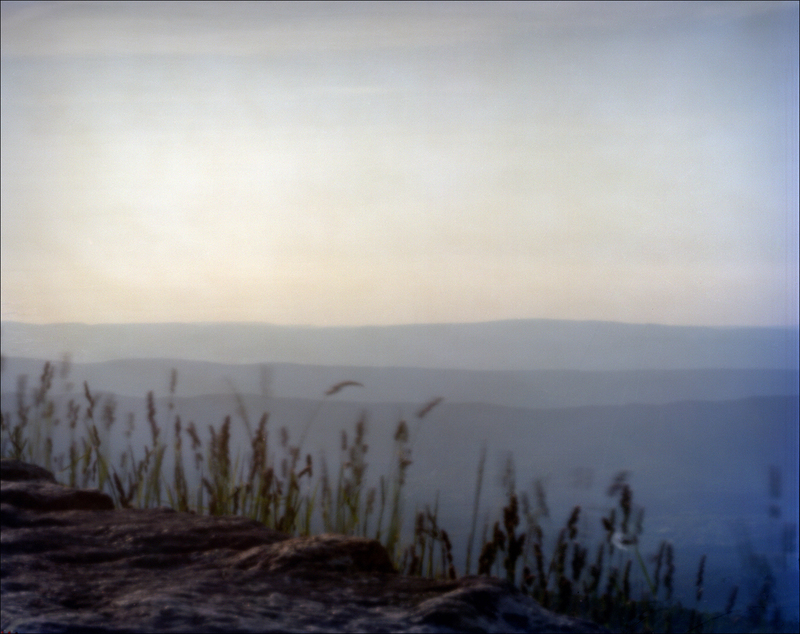 The images invite lingering contemplation. Coexisting alongside these battlefield landscapes is a photographic chronicle of the legion of dedicated reenactors, impeccably attired and historically attuned, who recreated scenes at one battlefield anniversary after another, heightening the eerie déjà vu of this expedition of commemoration. I had not expected, setting out, that these living historians would figure importantly in this project. But, on my very first battlefield visit, to Manassas, Virginia, for the 150th anniversary of the Battle of Bull Run, I encountered a band of Virginians portraying the units their great-greatgrandfathers had fought in a century and a half before. I marveled at the remarkable nexus of people, place, and history that was unfolding before my eyes. The impressions of these reenactors—so many descended (like those Virginians at Manassas) from the very soldiers whose uniforms they wear—brought a dimension of verisimilitude and narrative drive to the project and, through the poetic prism of the pinhole, emerged not as play acting or costume drama, but as ghostly evocations of the spirits that hang over these fields. 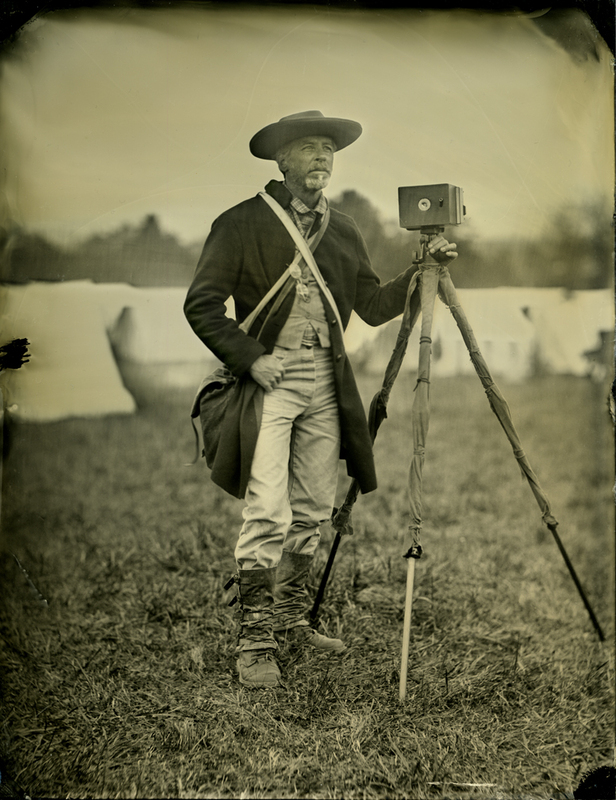 It was not too long before I found myself becoming one of them, a reenactor in the impression of a Civil War photographer arriving with his primitive wooden box camera onto these fields of battle, squinting my eyes and seeing before me timeless, epic landscapes, and the terrible, transitory struggle that left them sacred ground. This is, for me, a personal odyssey along the length and breadth of America’s deepest wound. I trust the images will evoke the wonder, the awe, and, ultimately, the peace I’ve found on this pilgrimage through the country’s consecrated domains. 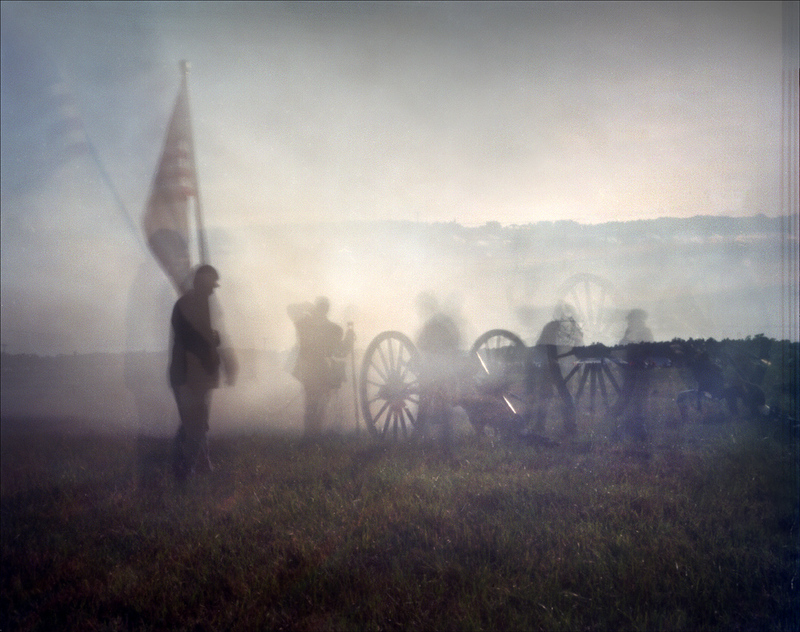 Your Civil War project is fascinating and has captured the interest of me and my octogenarian photographer/historian colleague Richmonder Willie Anne Wright…a nationally known pinhole artist who, for over 40 years, has produced stunning black & white/sepia and Cibachrome pinhole portfolios. 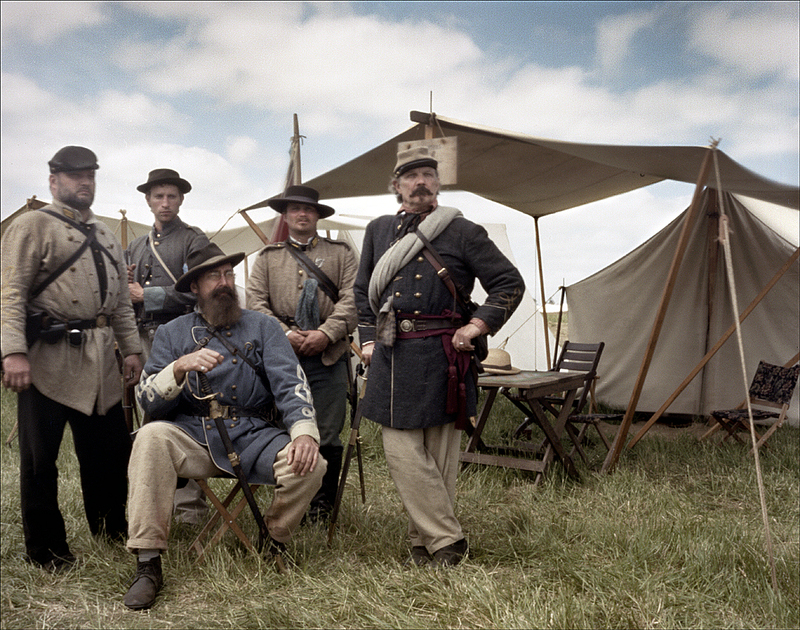 Most widely exhibited is her Civil War Redux series – re-enactment photos produced during a 12-year period beginning in 1987 – long before any mention of the 150th Anniversary of the War. Her prints are in many private and corporate collections including the Virginia Museum of Fine Arts here in Richmond – her hometown.. When I saw your images recently in the NYT Lincoln article by Nancy Koehn, I was startled by the similarity of your images to those of Willie Anne Wright. You both have a keen and gentle eye – and a fondness for the beauty of history. nothing wrong with being English��. I assume you’re the same Michael Falco I met in Seattle. I always thought you were a superb photographer–and your new work is mind-blowingly great! I hope that you and Kimberly are doing well. A very nice undertaking Michael. Your photographs are indeed magnificent. I couldn’t find any copyrights so I took the liberty of posting your blog on my Civil War Reenactment page at https://www.facebook.com/CivilWarCostumes. If you have a problem with this please let me know and I’ll take care of it.